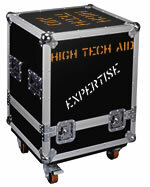 High Tech Aid is based in Stephenson, VA USA (East Coast Time Zone) and we offer services on a global basis. If you are looking for help with that RFID, bar code, or other AIDC technology project then maybe we can help. Contact Steve Halliday, President for more information. The newsletter is in hiatus, so we are not accepting any subscriptions. Old issues can still be read from the button on the side. For the most current news on IoT, NFC, and RFID then follow me on Twitter.